Do you ever swap,sell, or get rid of a polish you wish you hadn't? When I had my blog sale I really did not regret getting rid of my stuff. I think for the most part the colors I got rid of were colors I had dupes of or color that did not really work out for me. That being said, a few weeks after the fact I started to miss my Orly Goth. The funny thing is I never really liked Orly Goth. It was never glittery enough, but I did not know there were better black polishes with more glitter in them. 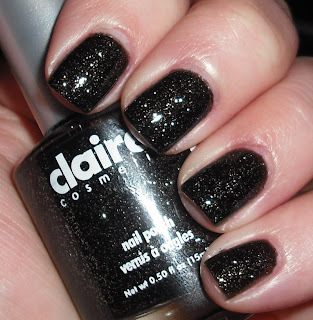 Then I came across Claire's Galaxy, and it remedied my regret for Orly Goth ten fold. This was what I wanted Orly Goth to be! Galaxy is a black polish mixed in with tons of tiny silver glitters. This is nice and sparkly ;0). I've managed to hang on to Goth, but I'm never quite happy with it. This is really cool though!